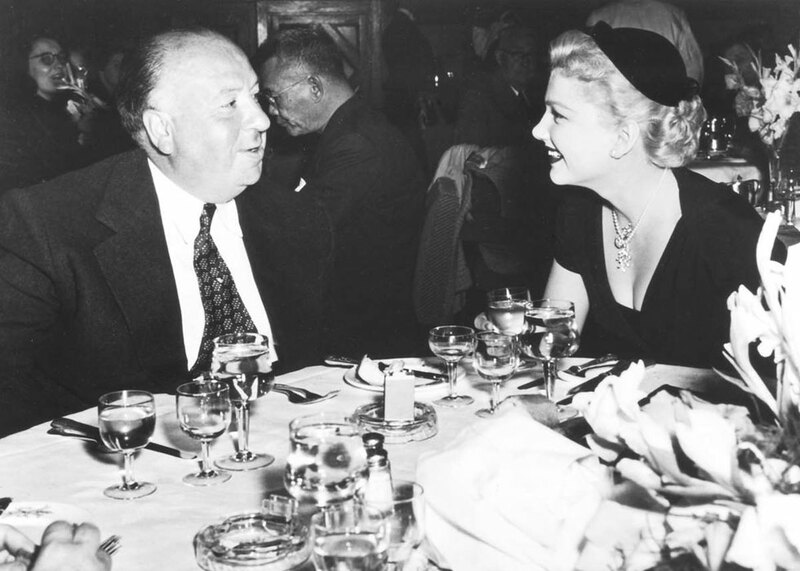 What do Céline Dion, Sir Winston Churchill, Grace Kelly, U.S. President Franklin D. Roosevelt, and Alfred Hitchcock all have in common? 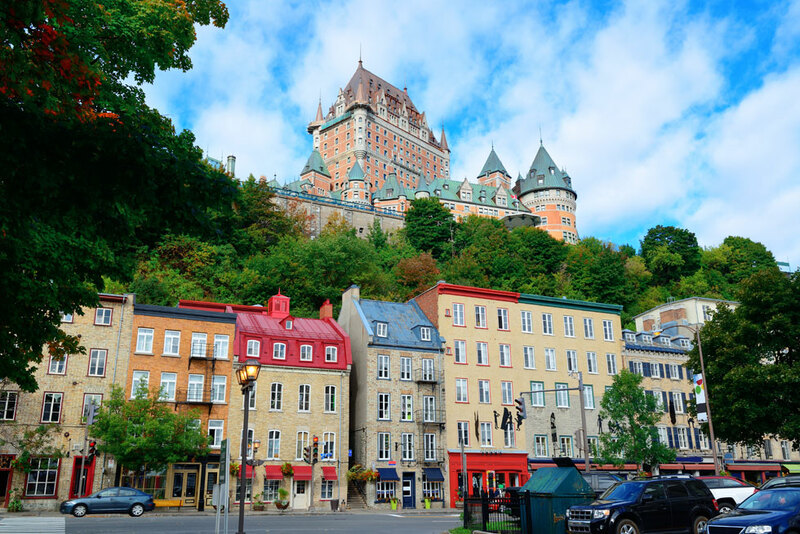 They were all guests at the illustrious Fairmont Le Château Frontenac in Quebec City, Canada over the course of its 125- year history, and many of them made history during their stay! “Throughout 2018 we’re celebrating the 125th anniversary of the hotel through concerts, photo exhibitions, culinary galas, surprise celebrity events, public tours, and even the first-ever commission of a hotel anthem in North America,” relates the hotel’s enthusiastic general manager, Robert Mercure. 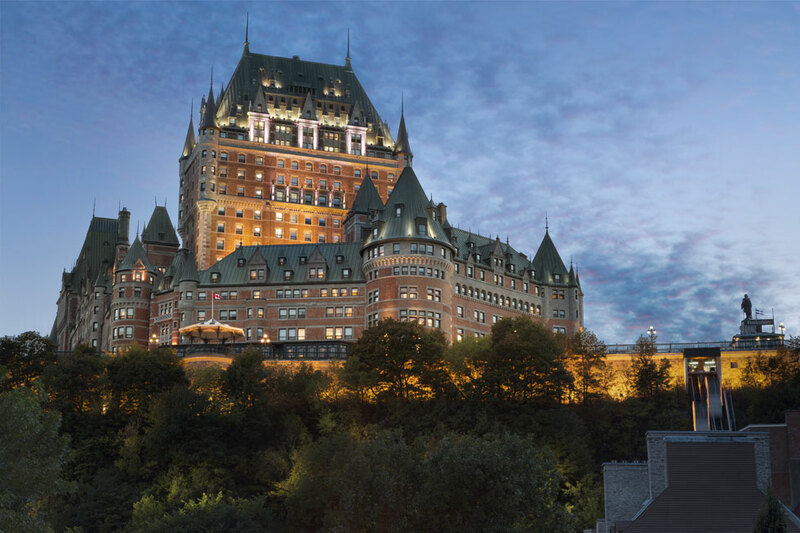 Fairmont Le Château Frontenac is dramatically positioned atop Cap Diamant overlooking the St. Lawrence River and Quebec City, the capital of the province of Quebec. It’s one of the oldest fortified walled cities in North America and a UNESCO National and World Heritage site. 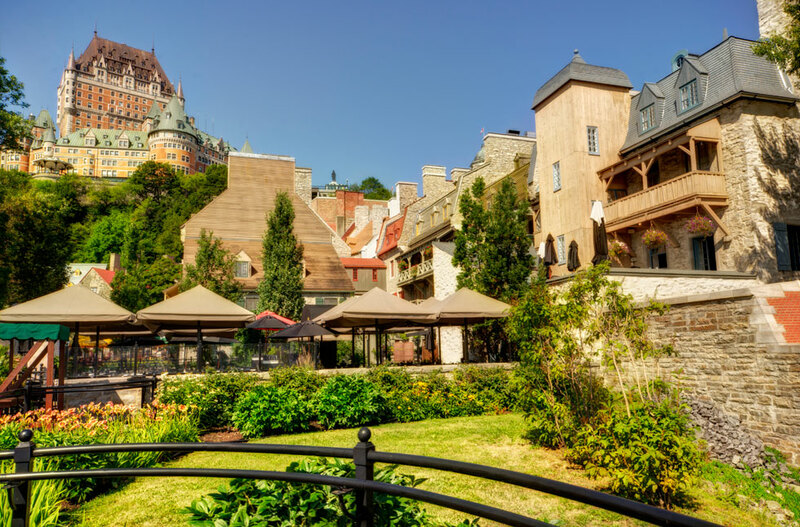 Little wonder Fairmont Le Château Frontenac is a dream setting for film and television shoots. 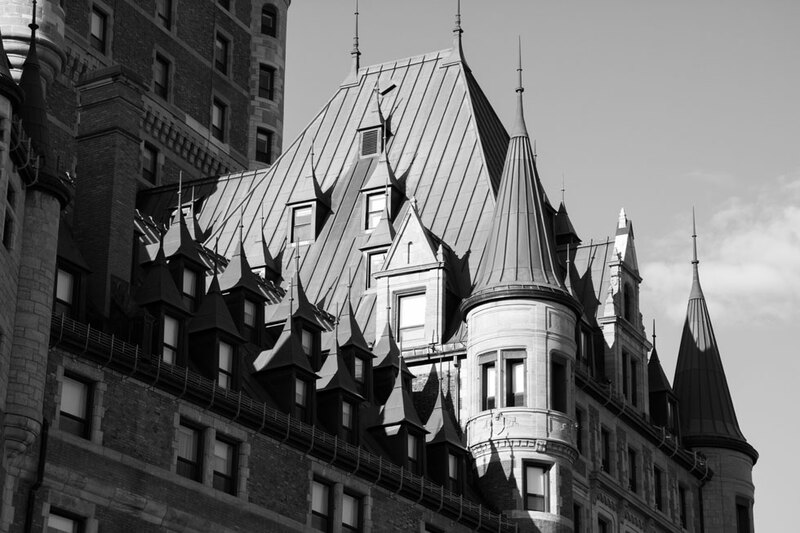 Inspired by the fairytale-like châteaus dotting France’s Loire Valley, it was designed by architect Bruce Price (father of American doyenne of etiquette, Emily Post,) for the Canadian Pacific Railway. And, like its younger sibling in Western Canada, The Fairmont Empress Hotel in Victoria, it was a luxurious respite for those travelling by rail past Toronto heading east. Officially opened in 1893, history buffs revel in the hotel’s amusing salute to its namesake, Louis de Buade, Count of Frontenac and Governor of the Quebec colony, New France: a dashing portrait of Count de Buade safeguards the lobby and a 300- year-old stone is marked in the hotel’s vaulted foyer; several original French coat-of-arms are hung throughout the hotel, and 17th and 18th century wine bottles found during the excavation of the site are on display. Santé! 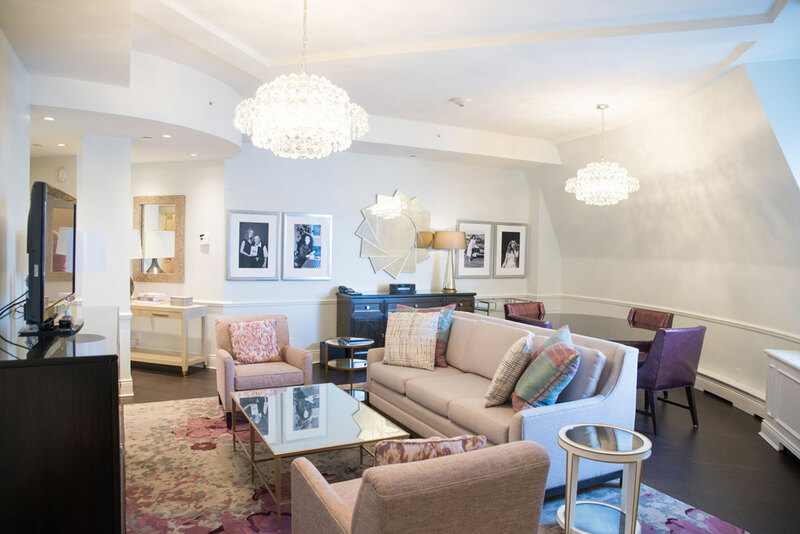 In 2014, the hotel underwent a massive $75 million redesign by Wilson Associates and Rockwell Group integrating elegant, contemporary decor while preserving the original towers, turrets and coffered ceilings. 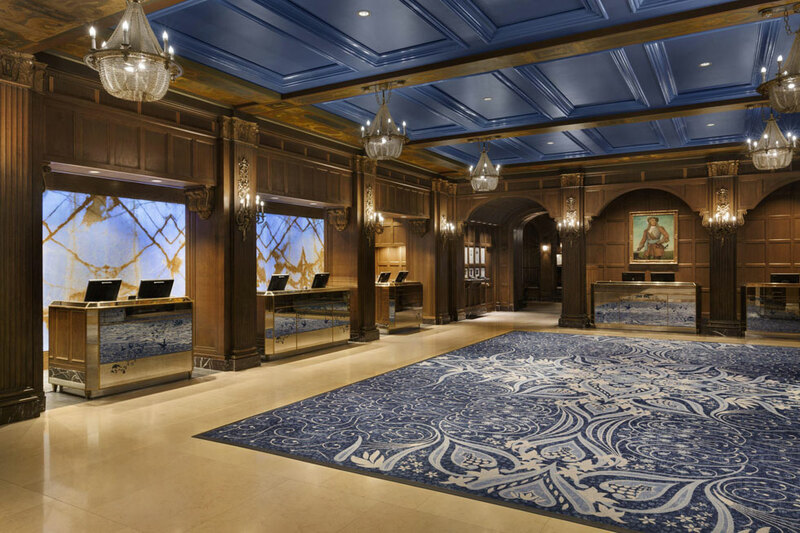 Drawing inspiration from the nearby St. Lawrence River, original mahogany beamed ceilings and walls are enhanced by the stunning use of regal blue carpets and striated Italian onyx backlit by LED lighting in the main lobby. Several art and photography exhibitions will be mounted over the anniversary year. 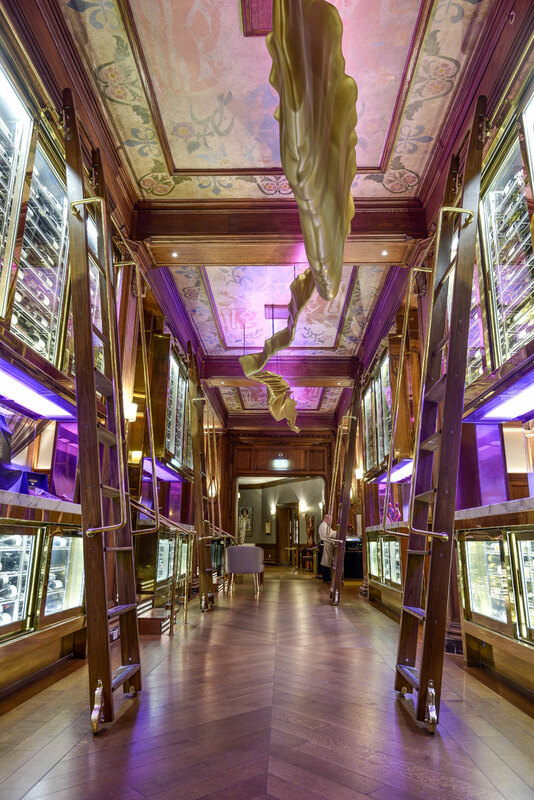 As you walk in the entrance of Le Champlain Restaurant you will be mesmerized by the floor-to-ceiling glassed-in wine cellars containing more than 1,600 wine bottles, but don’t forget to look up at the suspended art. River, by Charlevoix sculptor Marc Bouchard, is a 900-lb polyurethane sculpture that meanders like its inspiration, the St. Lawrence River from the tip of l’Île d’Orléans to Montréal. In August of 1943 and September 1944, Fairmont Le Château Frontenac hosted the Quebec Conferences (codename: QUADRANT,) a series of highly confidential meetings to plan the Normandy invasion attended by U.S. President Franklin D. Roosevelt, British Prime Minister Sir Winston Churchill, and Canadian Prime Minister William Lyon Mackenzie King among other heads of state. Over the years, other political dignitaries, including Dwight Eisenhower and Ronald Reagan, French President Charles De Gaulle, Francois Mitterand and China’s Chiang-Kai-Shek, have been guests at the hotel. “It’s quite remarkable that our former Prime Minister, (the late) Pierre Elliott Trudeau used to stay here with his little son, Justin, and now he is the leader of our country and has come to the hotel with his own family,” says Mercure proudly. Throughout July and August 2018, the hotel will honour the 75th Anniversary of the Quebec Conferences with a photographic exposition and talks with guest historians, David Mendel and Barry Lane. Officially opening on April 23rd, Fairmont Le Château Frontenac has designed eight Celebrity Suites decorated with photos, art and ephemera to honour notable former guests: Sir Winston Churchill, Franklin D. Roosevelt, Alfred Hitchcock, HRH Queen Elizabeth II, Charles de Gaulle, Princess Grace (will be launched later), Céline Dion, and Pierre Elliott Trudeau and Justin Trudeau. Did you know Quebec pop chanteuse, Céline Dion, signed her first international contract with Sony Records in 1986 after performing for a group of executives at Fairmont Le Château Frontenac? The Dion family has been invited to the opening of the Céline Dion Suite. In 1952, director Alfred Hitchcock shot the thriller, I Confess, starring Montgomery Clift and Anne Baxter, at the hotel with many staff cast as extras. 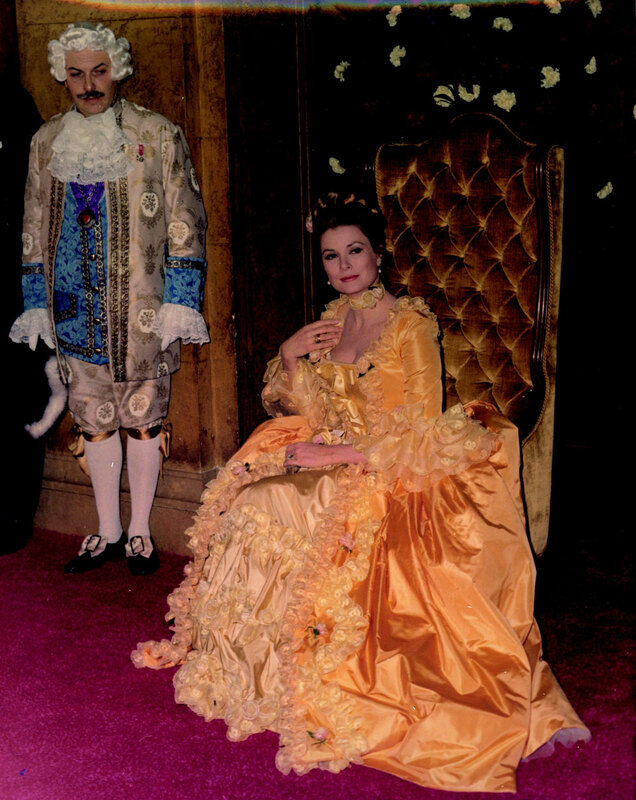 Actress Grace Kelly, who became Princess Grace of Monaco, presided over the Grand Ball at the opening of Quebec Winter Carnival in Quebec City in 1969. The son of Grace Kelly, Prince Albert II of Monaco, has been invited to officially open the Grace Kelly Suite. 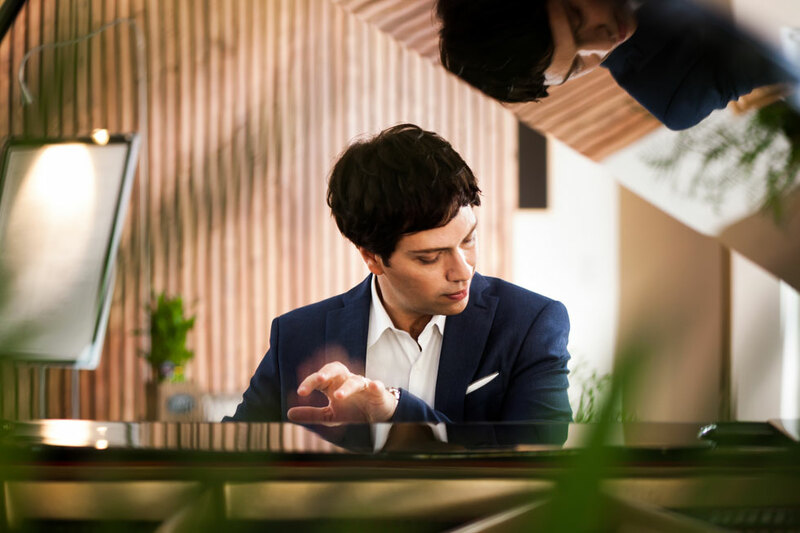 To plan your stay around the many events of the 125th Anniversary: A Year of Celebration at Fairmont Le Château Frontenac, here’s a helpful schedule in French and English. Please note: dates and times are subject to change so check with the hotel to confirm. Laura Goldstein will travel almost anywhere to write about (and eat) a good meal and explore hotels and homes with great design. These travels include dining in an underwater restaurant in Eilat, Israel to truffle hunting at a cooking course in Provence, France. A highlight of her 25-year career was covering Prince William and Kate Middleton on their 2017 Royal Tour in Vancouver, Canada.